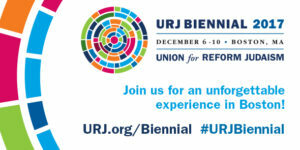 The 2017 Union for Reform Judaism Biennial is December 6 to 10 at the Hynes Convention Center in Boston. Don’t miss this nearby opportunity to join 5,000 Reform Jews for five fantastic days filled with meaningful worship, terrific learning sessions, joyous music, great people, beautiful Judaica, and the opportunity to learn and grow. Register now—early bird pricing ends October 10—or just come to the free Shabbat services that Friday night! You’ll return home spiritually refreshed, more Jewishly literate, deeply connected to the Reform Movement, and with creative ideas for us to try here at TEMV. There will be no Shabbat services at TEMV that Friday. We’ll arrange carpools into Boston for anyone who wishes to join us for the services there.